Yields drop. Crops become more susceptible to disease and weaker stock is an open invitation for pests to move in. Crucial to life,humates restore the natural balance in soil necessary for optimal plant growth, and provide the foundation for plant vigor. Humates are highly concentrated, natural organic humus,Humate is alkaline salt of humus from high grade leonardite. Humus is found in farm yard manure,compost. Humus is high quality soil improver, soil conditioner. Natural Potassium Humate is potassium salt of Humic matter collectively called as Humus also known as the Humic acid from high-grade natural vegetable , animal decay matter Leonardite. 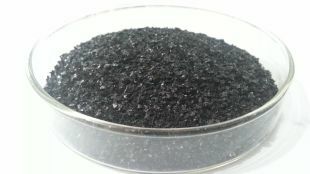 Humic acid is a principal component of humic substances, which are one of the major organic constituents of soil (humus), peat, farm yard manure, seaweed extract. It is also a major organic constituent of many upland streams, dystrophic lakes, and ocean water. It is produced by biodegradation of dead organic matter. It is not a single acid; rather, it is a complex mixture of many different organic acids. Potassium Humate: Potassium salt of Humus as used as high-quality soil microbe improved, organic matter enhancer and plant growth enhancer and soil conditioner and can be applied in landscape and garden as well as for all agricultural and horticultural plants. It also could support seeds during germination and improve their vigor by providing organic matter during germination. Its solubility is excellent, could be used in the formulation of various organic fertilizers. Price : Rs. 75 / Kilogram.